Plant roots are the main organs of nutrient and water uptake from soil. Genetic improvement of root traits is of vital importance for improving crop nutrient and water use efficiencies [1–5]. Understanding the molecular mechanisms controlling plant root growth and development is beneficial to molecular breeding aimed at improving root traits and resource utilization efficiency of crops. Previous studies have shown that plant root growth and development are controlled by phytohormones and sustained by the root apical meristem (RAM) [6–12]. Besides, redox regulation and the balance of ROS also have important roles in maintaining RAM activity [13–15]. Therefore, the growth and development of plant roots are regulated by complex hormone signals and other related pathways. CircRNAs are endogenous non-coding RNAs produced by back-splicing of pre-mRNA . The 5′ and 3′ ends of the circRNA are linked together to form a covalent closed loop structure . Currently, circRNAs have been widely studied in animals [18–21]. However, the role of circRNA in plants has not attracted enough attention . Until recent years, several literatures reported circRNAs identified in plants such as Arabidopsis [23–27], soybean [28, 29], rice [25, 30], maize [31–33], tomato [34, 35], barley , tea , cotton [38, 39] and wheat [40, 41]. For example, Ye et al. performed genome-wide identification of circRNAs in rice and Arabidopsis using available public RNA-Seq data and identified 12,037 and 6012 circRNAs, respectively. Moreover, the parent genes of over 700 exonic circRNAs were orthologues between rice and Arabidopsis, suggesting the conservation of circRNAs in plants . Chen et al. performed circRNA-Seq on maize seedling leaves and uncovered 2804 circRNAs. They found that sequences related to LINE1-like elements (LLEs) and their reverse complementary pairs (LLERCPs) are significantly enriched in the flanking regions of circRNAs . Furthermore, genes with LLERCP-mediated circRNAs are enriched among loci that are associated with phenotypic variation. Therefore, circRNAs are likely to be involved in the modulation of phenotypic variation by LLERCPs . Moreover, studies showed that circRNAs may also play roles in response to Verticillium wilt in cotton , maize iranian mosaic virus infection in maize , TYLCV infection in tomato , drought stress and nitrogen deficiency in wheat [38, 41]. These findings indicate that circRNAs are present in different plant species and may play important roles in the regulation of growth and development, and stress response. Deeper rooting is beneficial for plant production and survival under water and nitrogen deficient conditions [48–50]. Therefore, genetic improvement of root traits is essential for improving crop nutrient and water use efficiencies. Recent studies have shown that circRNAs are widespread in plants and play important roles in regulating plant growth and development, and stress tolerance [23–41]. However, whether circRNAs, as a new type of non-coding RNA molecules, participate in the regulation of root growth is not clear. Here, an integrated comparative root transcriptomic study of long root plants (LH9 and XN979) and short root plants (YN29) was conducted to explore this question. The number of circRNAs identified in each sample ranged from 285 to 478. More than 70% circRNAs belong to exonic circRNAs category. The intronic circRNAs only account for 3.9–6.5% of the total number of circRNAs in different samples (Fig. 2a). The proportion of intronic circRNAs is similar to the results of previous reports in Arabidopsis (3.8% intronic circRNAs), tomato (3.6%) and wheat (less than 6.5%) [16, 19, 41]. In the YN29-LH9 comparison and YN29-XN979 comparison, 33 and 22 DECs were identified, respectively (Fig. 2b). 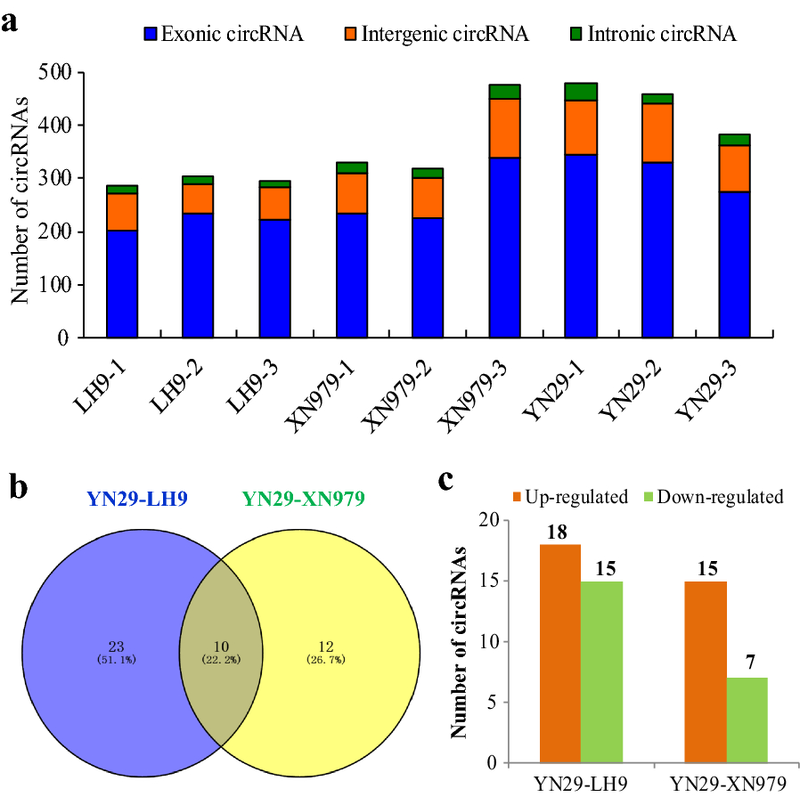 In total, ten circRNAs existed in both the YN29-LH9 comparison and the YN29-XN979 comparison. As has been mentioned above, both the roots of LH9 and XN979 were significantly larger and deeper than those of YN29 (Fig. 1c), therefore, the ten coexisted DECs in both comparisons should play more critical roles in the regulation of root length. Previous studies in animal and human have confirmed that circRNAs can act as miRNA sponges to capture miRNAs from their target genes via ceRNA (competing endogenous RNAs) networks [51, 52]. Similar reports have recently been made in plants [26, 34, 38, 41]. To reveal whether the ten DECs can target miRNAs and participate in transcriptional regulation of genes, psRNATarget software was used to identify potential miRNA binding sites. As expected, three of the ten circRNAs had two to nine putative miRNA-binding sites (Table 1), which was consist with another study in wheat . 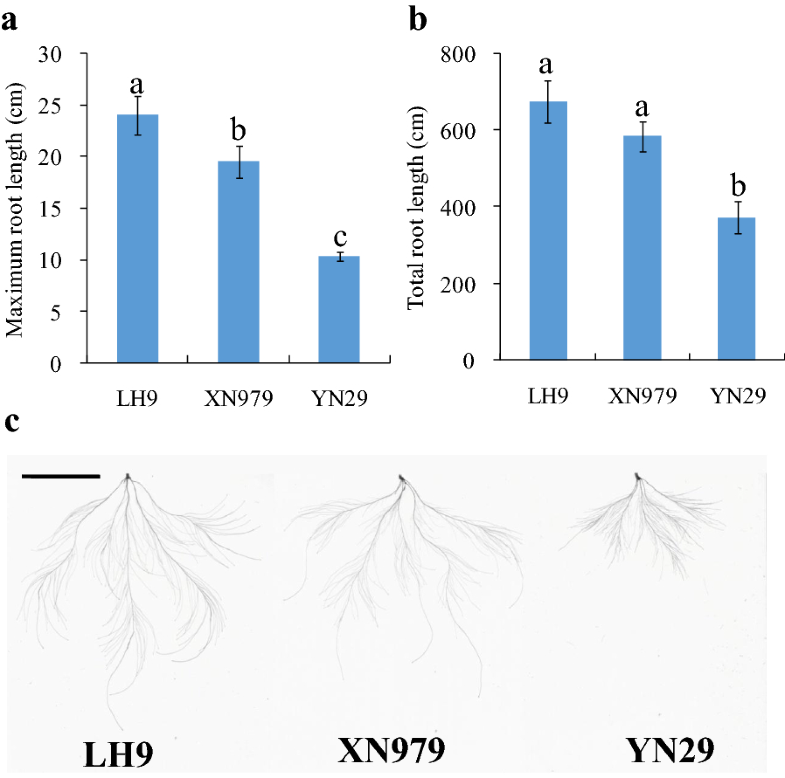 Moreover, the results of real-time PCR analysis showed that the expression levels of six out of the eight investigated potential binding miRNAs exhibited significant differences between the long root plants (LH9 and XN979) and the short root plants (YN29) (Fig. 4). Therefore, the expression levels of these miRNAs were correlated with their corresponding circRNAs. These results indicate that the three circRNAs may bind to the target miRNAs and modulate the transcript levels of these miRNAs. Interestingly, it has been reported that some putative target miRNAs are involved in the regulation of plant growth and development [53–57]. For example, miR164 has been reported controlling root development in Arabidopsis, maize and potato [53–55]. In Arabidopsis, one of miR164 target genes is NAC1, which transduces auxin signals for lateral root emergence [58, 59]. In mir164 mutants, plants express less miR164 and more NAC1 mRNA, and produced more lateral roots. Moreover, the mutant phenotypes can be complemented by expression miR164a and miR164b genomic sequences . Besides, the target genes of the potential circRNA binding miRNAs such as miR1122, miR1125, miR1134 and miR1133 are also involved in plant growth, development, metabolism and stress response [56, 57]. Therefore, these circRNAs may regulate wheat root length by modulating target miRNAs levels. We also noticed that different circRNAs may have the same miRNA binding site, and one circRNA may have several corresponding miRNA binding sites (Table 1). Since the mechanism of how circRNAs regulate their target miRNA are not clear in plants so far and these miRNA binding sites are predicted by psRNATarget software, whether circRNA can bind to each of them still requires further experimental validation. Furthermore, how do the circRNAs that do not have miRNAs binding sites work? What are the mechanisms by which different circRNAs coordinately regulate the length of wheat roots? There is still a lot of work to be done to clarify the regulatory roles of these circRNAs. 40659_2019_228_MOESM1_ESM.xlsx Additional file 1: Table S1. Primers used for real-time PCR. 40659_2019_228_MOESM2_ESM.xlsx Additional file 2: Table S2. List of differentially expressed circRNAs (DECs) in the YN29-LH9 comparison. 40659_2019_228_MOESM3_ESM.xlsx Additional file 3: Table S3. List of differentially expressed circRNAs (DECs) in the YN29-XN979 comparison.